The boarding house and hotel turned museum will give you a feel for what it was like to travel through Texas in the early 1900’s. The hotel was run by Fort Stockton resident, Annie Riggs. One the wall, you’ll find some of Riggs’ original house rules including no “spitting on the floor”. In the lobby, you will find the desk where former Pecos County Sheriff sat when he was murdered in 1894. No one was ever arrested for the crime and the murder remains one of the biggest mysteries in the area. 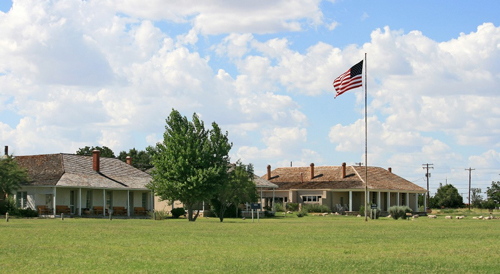 The U.S. Army presence in Fort Stockton dates back to 1858. During the Civil War, the U.S. Army withdrew from Camp Stockton and Confederate troops briefly occupied the site. After the Civil War, little remained of the military base’s 35 original buildings. Today, a few buildings sit on the original site including Officers’ Row, the original limestone Guard House, two reconstructed enlisted men’s barracks, and the original parade ground. One of the barracks now houses the museum and visitors center. 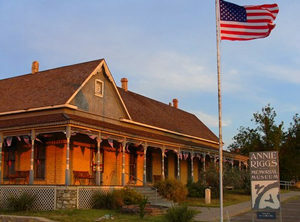 Fort Stockton is listed on the National Register of Historic Sites and is managed by the Fort Stockton Historical Society. 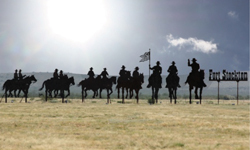 New Mexico artist, Brian Norwood, created two large sculptures for Fort Stockton, “March to Fort Stockton” and “Look to the East.” “March to Fort Stockton” portrays several soldiers following their commanding officer. “Look to the East” portrays a group of Comanche hunting for buffalo. In this sculpture, the leader is seen signing to those who are following to be aware of soldiers ahead. 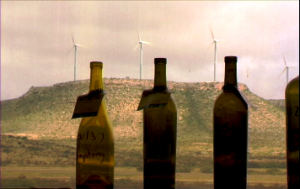 Mesa Vineyards is one of the largest wineries in Texas. In addition to produ cing the popular wine brands Ste Genevieve and Peregrine Hill, Mesa Vineyards also runs a tasting room at the Grey Mule Saloon. The Grey Mule Saloon was built in the 1880’s to serve cowboys and Texas Ranges. It was one of four original adobe structures in Fort Stockton. The saloon sits across from Annie Riggs Memorial Museum. 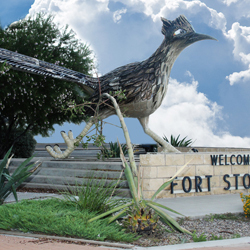 In addition to the vast history that Fort Stockton has to offer, it is also home to the largest roadrunner in the world. The 11 foot tall and 22 foot long Paisano Pete was named a true Texas icon in a 2011 issue of Texas Highway’s magazine. He is one of the most photographed “birds” in the world. Learn more about these attractions and Fort Stockton here. All photos are courtesy of Historic Fort Stockton.